in all 12 keys ! "… No dry practice patterns, but lovingly composed and arranged songs in different styles and tempi, that work perfectly as scenes for ones' own soloistic fantasies…"
"Be it for teaching, for realizing ideas or simply for a virtuos performance – those playbacks offer a groovy, lively and good-sounding accompanying band, which every soloist desires. Just by pressing a button, one can get every key and every style between pop and rock - great!" "With different styles of rock and pop music, this CD offers excellent playbacks for improvisation. The beginner as well as the advanced musician can try himself as a front man of a modern rock/pop band and at the same time improve his skills of playing solos. A contemporary instrumentalisation and modern grooves assure that fun will not be a raw deal. Great that there is finally a "Play-A-Long" CD for future rock and pop stars!" Now I would like to excuse myself, I want to play along to Track 14, Reggae in G-major." SOUND & VISION (Issue 2 / 2002) describes the production as "extraordinary" and further: "The practising player can specifically deal with the harmonic surrounding of his improvisations and thus further develop the skills for playing solos. Even though the harmonics are easy, already the first track in C-Major has a good sound, making it unproblematic for beginners to get along and, with the help of the CD, to develop their skills. "The CD sounds very good and "fresh" - not like "canned music", the songs are diversified and stylistically wide-ranging." and further: "With a price of 12 Euros, the CD is a very cheap offer." and "Conclusion: A promising approach, which should not be - with respect to the really low price - endangered by copying this CD." MUSICOUTLOOK (Issue 6/2002): "The learning effect goes far beyond the style: Thus, trumpeters and saxophonists do have to deal with the typical guitar scales like E-Major and A-Major, while the colleagues from the guitar fraction also have to play solos in typical wind scales like A-flat-major and E-flat-major, which is extremely beneficial for the ability to play together." and further: "There is no dispute over the quality of the product...........all kinds of instrumentalists can play at home and appear at the band practice without a thick neck. And that is good. Really." MUSICIAN (Issue 6 / 2001): "What was missing up to now were practice playbacks in the rock and pop area, which systematically introduce the learning player into the subject and accompany him through the different harmonics and scales. 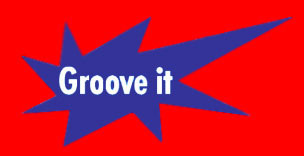 With Groove it – Playbacks Vol. 1, Jörg Sieghart managed to fill a gap in the market." and more: "Further CD's of the Playback-series are supposed to follow...we are excited and are happy about this engagement of Jörg Sieghart, which crucially enriches the market.". MUSIKER MAGAZIN (Issue 2/2003 – magazine of the German association of rock musicians): "The investment remunerates for any band." 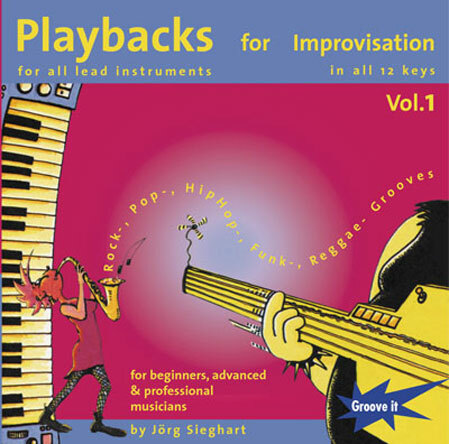 Search: "joerg sieghart" or "playbacks for improvisation"
If your are looking for professional drum jamtracks to download just click here !